After acquiring his A.B.A. degree in 1967, serving in the Vietnam War and finally getting his A.B.S. degree in Marine Technology, Doug and his wife headed for Brazil. There he worked laying underwater pipeline for the Brazilian government. He returned to the states in 1973 (New Orleans, La.) to continue his diving trade in the oil field business. Shortly after relocating to Louisiana, Doug had his first son, Jonah. In an effort to spend more time on-shore with his family, Doug found it necessary to switch careers. In 1974 Doug joined a group of contract painters to hone his painting skills. He quickly moved on to self-employment and established “Doug Brown, Contractor” later that year. Initially, Doug did maintenance and renovations on commercial, residential and rental properties. His skills grew to include sheetrock hanging and finishing, extensive carpentry, plumbing and electrical work, roofing, and concrete work. As business grew, so did his family. Doug had four sons and one particularly awesome daughter, who spent their summers working for dad. While three of his sons have worked with him on an as needed basis, his eldest (Jonah) is committed to a long-term partnership and has brought with him a more modern approach to doing business. 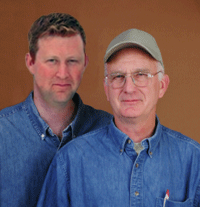 His business savvy coupled with Doug’s traditional professionalism has made them a dynamic duo. Today, Chelsea Paint & Carpentry (now a licensed builder) has expanded further by forming a partnership with Arbor Masonry, Inc. This venture will create more opportunities in building from the ground up, given the additional manpower and experience now available to the team. It’s time to increase the value of your home. We are licensed and insured and are always more than happy to show proof. Your project is not meant to create any added stress. The most responsible thing any homeowner can do is always employ a contractor who is fully and appropriately licensed and insured. You’ll protect you, your home, and your loved ones. Chelsea Paint & Carpentry is proud to offer it’s valued painting and carpentry customers a 3 year limited warranty guaranteeing the quality workmanship that we are known for throughout South Eastern Michigan. We stand behind our work and our dedicated staff of talented professionals and consider it a privilege to work with you. Because of our proven track record, you can expect the highest level of professional service at all times. Our customers become repeat customers and we require our crews to treat them with the utmost respect and honesty!